I have drawn a schematic of 2N3904 2N3904. Here is a simple audio amplifier with an npn transistor. 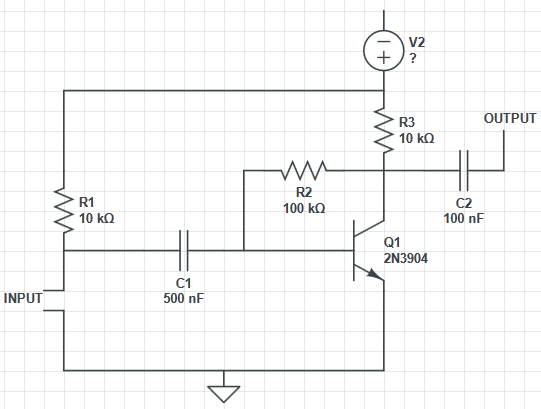 What should be the value of voltage source V2? How can I calculte it? output connects to a speaker and input can be pc or mp3 player. Could you teach me ? I'm new to audio and electronics. Dude, you're doing it all wrong! 2x6 will be around here soon to tell you 2N3904 should be a 12AE10. In that case, V2=160V. 1. I don't think this is going to be sufficiently powerful to drive a speaker, at least not with any noticeable volume. The transistor is a low power one, rated for well under a watt. Looks like more of a preamp stage than a speOther limits for the 2N3904 are 200mA current and 625mW power, so let's see...aker amp. 2. The transistor is rated for ~40V max, so that is the absolute highest, but this seems more like a circuit that would run on 12V or less to me. 3. R1 seems to be in an odd place, normally input resistors like that are connected to ground not to a power rail. EDIT - might have found the original source, or at least another instance of it. In the following link the author is using a 3v cell, which seems reasonable. Looks like more of a preamp stage than a speaker amp. Another argument for this being a microphone preamp are the values of R3 and C2. R3 is going to limit current to the point where driving a speaker isn't likely to work, and same for C2 at audio frequencies. Note that the real answer here would be to go with at least a two transistor circuit but assuming that experimentation & learning is one of the goals here (in which case starting with 1 transistor is good). Circuit ignition, enabled by V2 connected to 120VAC, will certainly provide more enjoyment than listening to any audio through this amp.